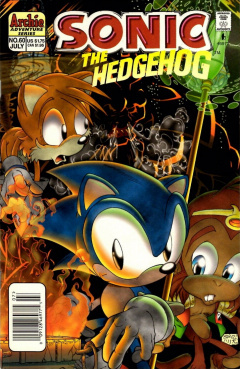 Sonic the Hedgehog 60 is the sixtieth issue of the Sonic the Hedgehog comic. This comic features two stories. The lead story is entitled "Arsenal of the Iron King". The back-up story is entitled "Tales of The Freedom Fighters - The Ultimatum". Miles "Tails" Prower is carrying Sonic the Hedgehog in the sky. Still on the trail of Ixis Naugus, the heroic duo are sweating up a storm. That's when they discover an entire mountain lit ablaze. Tails swears this must be a trick or illusion, as a raging fire like that would have engulfed the entire forest, but is instead confined to the mountain. Sonic dismisses the idea, noting that a simple illusion wouldn't cause such intense heat. Nearing exhaustion from the heat the two see village at the mountain's base and decide to land. Once on the ground, they meet a young Mobian female. The parched heroes ask her for a drink of water. She tells them that she cannot spare any water, for the supply is very low and closely rationed. She goes on to tell them that the mountain has been on fire for over a hundred days. Tails suggests that if it has been burning so long, why doesn't the town simply move elsewhere? The girl's grandfather appears; introducing himself as Li Yuen and his granddaughter as Li Moon, he explains that such a thing is easier said than done. Tuning the question back on Tails, he asks if they would be so quick to leave the place they've always called home. Sonic takes the point, then asks what phenomenon is even causing the fire in the first place. Li Yuen explains that it is due to the Curse of the Iron King. His people refused to abide by the rule of the Iron King, so his wife, the Iron Queen set the mountain ablaze as punishment. Nothing can stop the fire except for The Enchanted Fan of Fen Xing, which is locked away in the Iron King's arsenal. Sonic takes these details as a challenge, as he and Tails rush to save the day. On the trail, Sonic tires out. Just as he and Tails are about to take a five minute break, a group of stormclouds gather on the horizon. Sonic thinks a rain shower will serve as just the refreshment they need, but instead the clouds only serve up bolts of lightning! They dodge, only to find that the cause of the cloudstorm is none other than Monkey Khan, the cyborg simian Sonic squared off against in issue 55! Monkey Khan attacks, professing his loyalty to the Iron King. Apparently, Monkey Khan does not remember burying the hatchet with Sonic the last time they met, nor does he even remember the hedgehog at all. This tips Sonic off that the simian is most likely either possessed or brainwashed, with a set of freaky eyes offering an even bigger clue. The Iron Queen then appears before them, boasting that Khan's rage and fury makes him the superior fighter. Sonic is unfazed, saying that to "Be the man, you gotta beat the man, and I am the man! ", while delivering a drop-kick to Khan's jaw. While Sonic and Khan battle it out to a cliff's edge, Tails strikes directly at Khan's puppet master. He breaks her staff in a dive attack, and with its destruction, Khan is free. Khan comes to his senses, and the Iron Queen retreats. Sonic, Khan and Tails take a closer look at the Queen's broken staff, and find it contains a pair of Power Rings. Khan, having just changed back into himself again, considers the idea of a strategic withdrawl, but Sonic is eager to press forward. The trio arrive at the Fortress. The fortress is an ominous sight, and Tails stutters in describing it. Sonic is unfazed, seeing the architecture as an obvious ploy. Khan has a feeling that they're all walking into a trap, and Sonic knows it's a trap, but still wants to push onward without delay. As they roam the halls of the fortress, they confront the Iron King himself! He charges, shouting that any thief or intruder he deals with personally. Sonic sends Tails onward to find the fan, leaving himself and Khan to tackle the King. Tails finds it in no time at all. He hands it off to Sonic, who promptly turns the fan on the Iron King, blowing him away. They arrive back at the burning mountain, finding an angry Iron Queen in pursuit. They put out the mountain fire, and the queen flies away. They land in the village, with everyone in celebration. Sonic is humble, though Tails reminds everyone that they couldn't have succeeded without Monkey Khan's aid. Li Yuen tells of a prophecy of a great Monkey King, taking Khan by surprise. Sonic is not enthused, saying that he needs a new publicist. The six page back-up story begins with Princess Sally coming into a room where her father, King Maxamillian Acorn awaits her. Now that he's had the chance to collect his thoughts, he wishes to discuss important family matters with her. He says that ever since he ordered the dismantling of the Robians, she's been questioning his judgement. He admits that he was not "himself" when that decision was made, and has since reversed his stance and allowed the Robians their own colony in Knothole Village. Sally corrects him, stating that they're Mobians too, but the King reminds her that more than a few of his subjects would beg to differ. But the Robain/Mobian issue is not why he wanted Sally to appear before him. He opens and escorts her down a secret passageway, a passage he has not traversed in years. Sally didn't even know of its existence. The King says that is because she's not supposed to; at least not until the proper time. That time was supposed to be her tenth commemoration, where she would then learn of her true birthright and responsibilities. He shows her the Source of All, the shimmering pool of metallic gold and silver. He tells her that she must decide whether or not she wants to take rule of the realm (thus also undergoing a bonding with the Source of All), but should she accept (as the first female to undergo the right), she must first be betrothed. Sally is visibly disgusted at the idea of taking on a husband at this time in her life, and she adds that Sonic would run for the hills if she were even to mention the subject. The King is incensed by the idea of a commoner like Sonic the Hedgehog becoming King, stating dramatically that he's out of the question. He adds that the monarch does not choose their mate, the Source does. He adds that he and Sally's mother were betrothed at age eleven, married at eighteen, by the advice of the Source of All. This same source now, he finishes, is calling for Sally to marry Antoine D'Coolette. This issue is the debut of the Iron King and Regina, the Iron Queen. They would not return until Ian Flynn took over writing duties.